Bright lights, a clear as glass stage, giant sized movie screens, stunning visual effects, and a gorgeous red carpet with desirable dresses and handsome penguin suites. Yes, last night was Hollywood’s most coveted and glamourous night, the Oscars. Hosted by 9-time presenter Billy Crystal, the Academy heavily relied on the beauty and wonder of the old cinema as its backdrop in the Kodak Theatre in Los Angeles, CA. While it was wonderful to watch all the women delicately walk by in their designer gowns, the main ceremony succeeded in providing a keeping people at the edge of their seats of who would win what award. The opening special sequence before the ceremony was an outrageous mashup of pivotal moments from the latest Oscar nominated films that centered around Crystal’s adventure of arriving at the ceremony. You could not help but laugh at him as he conversed with teen-idol Justin Beiber in a horse drawn carriage (poking fun at Woody Allen’s Midnight in Paris), or his final sprint to the finish through a movie projector aided on by Meryl Streep as Margaret Thatcher in The Iron Lady. Crystal continued on this momentum by delivering fantastic opening jokes and musical numbers to poke fun at the nine films nominated for Best Picture. You could not doubt his stamina due to his Broadway-esque style of singing and sharp timing. Thankfully, he is a what you can call a truly reliable entertainer for an awards show. But if would have helped if the sound engineers re-mixed the sound so the orchestra did not overpower his singing during his opening act—with any live broadcast though mistakes happen. It was no surprise that Octavia Spencer won the Best Supporting Actress for her role in The Help as Minnie, she was always considered the front-runner from the start. She made the audience laugh, though, when she thanked the Academy “for putting me with the hottest guy in the room.” But it was equally special that Christopher Plummer won Best Supporting Actor for his role in The Beginners, as a closeted older gay man. The gracious actor took great care to thank the Academy for this honor, his co-stars for working on this film with him and his wife Eliane Taylor. It was also an eye-opening moment if you realized right then and there that, at age 82, Plummer is now the oldest living actor to receive an Oscar. 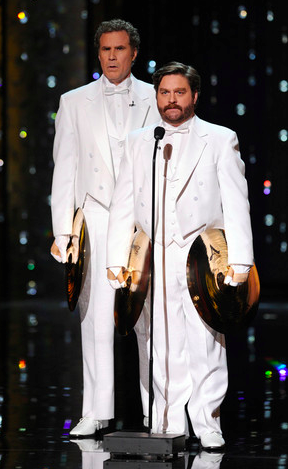 Will Ferrell and Zach Galifinakis almost stole Crystal’s thunder as presenters for Best Original Song with crashing symbols while walking out of the musical pit and onto the stage. With stone-cold comedian faces and musical instrument handling mishaps, you could hear the audience trying not to succumb to a state of laughter that would leave them in stitches. I had this gut feeling when I saw the Iranian film A Separation, nominated for Best Foreign film, that it was going to win that highly prized Oscar. That hunch came amazingly true last night when it won, convincing me I need to watch for its cultural significance and current reflection on Iranian culture. While the Oscars every year throw together a dance sequence from a performance troupe or choreographer, this year a piece was produced by Cirque du Soleil. With tremendous flexibility and bravery, the group executed a nearly flawless piece that took us inside the movies from the physical reel of film to the action projected on the screen. Though there was a moment when a pair of performers slightly missed a landing in a formation, it did not ruin the overall image that was being composed before the audience. Throughout the proceedings, it felt like Martin Scorsese’s Hugo was winning every award; the name of the film just kept getting called for one award after another. It was visually stunning film, so it is no wonder then that the Academy awarded it with accolades such Best Art Direction, Cinematography. Visual Effects, Sound Editing and Sound Mixing. But we cannot forget the closely watched Best Actress and Actor award. It came as a personal shock to me that Meryl Streep won for her role in The Iron Lady’s British Prime Minister, Margaret Thatcher. I saw her performance in the film and it was spot on, some of the finest acting I have experienced. She executed the role with perfect ease, so this must have been a difficult vote to cast because there were so may great women who were nominated as well (such as Viola Davis for The Help, and Michelle Williams in My Week with Marilyn). Streep kept it simple though by humbling accepting the award and acknowledging the work her fellow nominees delivered this year. It was a sigh of relief that George Clooney did not get Best Actor for his role in The Decedents. While he is a great actor, he tends to exhibit characters that all borrow similar traits and mannerisms. It was clearly appropriate then for Jean Dujardin to win the award from his work in The Artist. Two of the year’s most talked about films, The Artist and The Help, equally deserved to win Best Picture. But it was The Artist that won, the delightful silent-French film set in 1920’s old-Hollywood. This appeared to signal that Hollywood is in love with itself and would prefer to pass over films that allow us as an audience to reflect upon our country’s dark history. Yet, it demonstrates that a movie does not need to have talking actors to become an award-winning film. Maybe it gives films the opportunity to rely on other visual methods of storytelling. Either way, it was a shame that there could not be a tie between the two movies. It was disappointing to find out though too that this broadcast had the lowest ratings ever — only 31.8 million people tuned in to this event. The buzz and excitement of this years Oscars probably did not entice fans enough to watch the show. It may even give us pause to consider how this kind of show can continue to entertain us for years to come or if it is time to go off the air. An idea for next year’s theme at the Oscars: movie genres, but we may want to keep the gore and thrilling sequences to a minimal. Every year millions of people tune in on a Sunday night in February to watch the Academy Awards present “Oscars” or “Best in….” awards to actors, directors, producers, and other creative talent for delivering the highest achievement in cinema. But not many are aware of what The Academy of Motion Arts and Sciences is, the organization that owns the Oscars and are responsible for the membership of the academy. So, there are a lot of famous artists in the film industry that you might recognize who are a part of this academy, such as Jennifer Hudson, Michelle Williams, Wes Studi, director Christopher Nolan, musician Bono and many more. And that means that the judges of those prestigious golden statues are everyone’s peers, unlike critics in the Hollywood Foreign Press who present the Golden Globes. The Academy however does not list on its official website a full list of its members, only a handful of samples for each group of artists or categories. How does a film get nominated? According to the film’s official website, a film must open within a January 1 – December 31 calendar year in Los Angles county, CA (unless the entry is a foreign film) and be at least 40 minutes in length (or the film is submitted as a short film). The studio that owns the film usually submits its film, cast and crew in for consideration of nomination in a certain category. After ballots are distributed and gathered for a tally of the votes, a private firm, PricewaterhouseCoopers in this case, secretly counts all the votes. Nominations are then announced in early January followed by the spectacle television broadcast in February. While this is a just a basic outline of the many rules and procedures that run the Academy, it appears to be a tightly controlled system so the nominations and awards are appropriately handled. But while watching NBC Nightly News recently, I came across a segment that examined who the members of the Academy were. They explained that the Los Angeles Times uncovered recently that the Academy is 93% white and 77% male with the median age at 62. It was also revealed that 98% of the screenwriters are white and 97% of cinematographers are men. And membership is for a lifetime. Does that mean that the Oscars for Best Picture, Actress, Actor, etc. are determined by an elite group in Hollywood? Some might question then how slowly change comes for the Oscars to become a diverse body of members. But change is slowly coming. There are more internships, grants offered by the Academy to promote a range of diversity in film and actors like Alfre Woodward are trying to round up more people from different backgrounds in the film industry to encourage them to become sponsored by a member of the organization to become a member. What we will always question though is how close the votes were for determining the winner of an award. For example, I still wonder to this day how many more votes did Brokeback Mountain needed to receive the award for Best Picture when it lost it to Crash. Though the votes may not always reflect the current diversity and landscape of the American people, at least it continues to intrigue us about the magic of Hollywood and provides us projects that entertain or inspire us or call us to action (thank a well made documentary or biographical film for that). 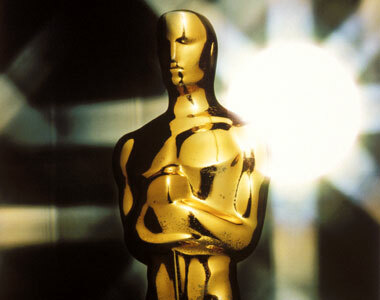 Watch the Oscars tonight on your local ABC channel at 7:00 pm EST/4:00 pm PST. To learn more about the Academy, visit oscars.org — for more information about the 84th Academy Awards, go to oscar.com (an ABC channel website dedicated to this event). A review of the 84th Annual Academy Awards will follow the next day.